Here are three tips to getting the most out of Magento's theme capabilities when faced with unique challenges. One of Magento's greatest strengths is its flexibility. With that, no expense was spared to create a powerful, robust theming system which merchants and developers can easily control. At Groove, our teams like to get creative with Magento shops, and to really push the limits when it comes to customization. Here are a few tips for how to go about getting the most out of Magento's theme capabilities when faced with unique challenges. One of the most important aspects of a Magento theme is in its ability to rely on what is already done. Out of the box, Magento's default themes ship with hundreds of building blocks that merchants and development teams can use to quickly make design changes. You don't have to rebuild from scratch every time you want to make or use a new theme. Instead, a custom theme may extend or inherit from another theme. The effect is often a drastically reduced development time. Furthermore, it produces a consistent experience across the platform, even through future design iterations and in a way that is likely upgrade-safe. Another great theming feature of Magento is the ability to swap a theme temporarily. Let's use a real-world example to explain the benefits here. Let's say you are an office supply retailer getting ready for a “back to school” sale. As the fall season arrives, you want to adjust your Magento theme to use seasonal colors and images for your "back to school" promotions. You would make these changes to your design as part of a new theme. Then in Magento you can enable this theme for a set period of time. The great thing about this feature is that you can "set it and forget it," as it gives you ample time to prepare your theme and no hassle of remembering to remove it later. Plus, you can use it again next year! 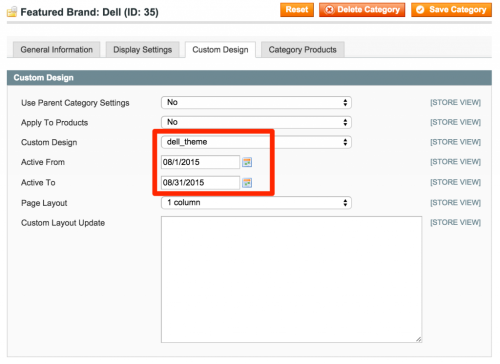 Lastly, Magento offers the same flexibility as shown above when managing categories and products in your catalog. How about another scenario to illustrate? Let's say you are an electronics retailer. As you may carry several brands of a laptop computer, you might want to feature one specifically. Or, maybe it's part of a paid incentive from that manufacturer. At Groove, we might go about solving this by placing all relevant products of this brand into a category. Then, using Magento's flexible design system at the category level, we would change the theme just for that category. Here you can see that we're only applying the theme for a month. Thereafter, it will fall back to the configured default for the store. The great thing about working with Magento as an eCommerce platform is that it allows complex problems to be solved more easily. Its theme capabilities are no exception to this benefit, and we encourage you to explore them as they meet your web shop design needs. Looking for other tips and tricks to make the most of your Magento storefront? Check out our 8 Ways to Supercharge Your Magento Website eBook and contact us today to learn more about our Magento certified Development Team.